For the first of what is intended to become an annual race, here’s my take as an experienced pacer and longtime member of the local running community. I have been back to running a bit over the past five weeks, but it’s been once or twice a week tops since my old injuries keep rearing their ugly heads. So when Pacer Jim asked me to help out I said “Sure!” provided the pace was 8:30 per mile or slower. I got assigned 8:30 as requested and my husband indulged me last week with two pace training runs at 8:30 pace. With that out of the way my real job started Saturday morning as start line traffic controller, race safety patrol, and Cleveland advocate! I was at the start by 8:30 after a brief warm up with my 8:30 pacer sign in hand. My fingers and toes may have been a bit chilly, but pacers make for good crowd control at the start, so I was glad to be there! As a pacer, your first priority is to make sure runners see you, so they can line up in the appropriate pace order. As the 8:30 pacer I was positioned a few hundred feet from the start and encouraged those who would be faster to pull ahead and those more leisurely to fall in line. I think this worked out pretty well given the race was afforded two lanes and wasn’t closed to traffic. I had a huge group and was pleasantly surprised by the amount of runners who actually fell behind my group when told the system – it may surprise you to know that at many races, people often ignore the corral system, making it difficult for faster runners to pull ahead once the race starts. Novice race directors take note: pacers can really help with this problem! Being a first year race and more of a fun run than speedy event, we were all informed the distance was not officially 5k or 10k. The race starts at Higbee’s Department Store and ends for 5k runners at the Christmas Story House. For my 10k runners, I made sure they knew we might be going 6.4 and that we would target 8:30 pace but it would vary given the 1st mile bridge, crowds, and wind. I had a large group around me, ten or more, with whom I interacted throughout the race, and had three runners personally thank me, 2 after the race and one just before the finish, which was so nice. I couldn’t have asked for a more fun group to log some miles with me! Instead of my usual marathon banter about pacing I mostly called out when sections were icy, when corners were coming up, when we needed to be aware of traffic and took the lead in requesting room for returning runners on the out and back sections that were crowded. No one in my group fell or was pushed off course. Mission accomplished! In Cleveland this weekend, it was cold! The temperature was below freezing and, alas, there was a bit of ice on the pedestrian paths. A good standby of my pacing routine is to do a warmup along the course, which helped me do a little recon. I’m glad I did, since I discovered the planned return route was going to be dicey! Other than that I give the course two Pepper thumbs up! One of the best views of the city on the 10k returning course! For you locals, try this race next year if, like me, you are sick of Cleveland races that take you out and back on Marginal Road. Kudos to Amy and Jim on finding a route that was pretty close to the target distance (an easy start line/finish line adjustment for next year!) and with great city views throughout. 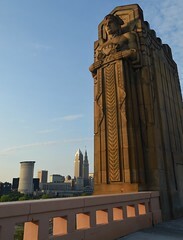 Mile one takes you from public square past “The Q” Arena over the Hope Memorial Bridge. This was perfect on the way out as the bridges lanes were ice-free. The markers weren’t perfect and my first mile was a bit fast around 8:23. Coming off the bridge you make a left into residential Tremont and other than a bit of slush road conditions were good. I never saw the 2 mile marker but kept busy pointing out scenic views for my runners, and the race had Christmas Story fact signs out, which were fun to read to the group! Heading to mile 3 I let 5k runners know when they should make their kick and while I heard rumors of an issue at the split there were no issues for my group. It was tight, but we navigated the sharp right turn for the 10k-ers with ease and settled into about an 8:25-8:27 pace for the run. Given I thought the course was long I was fine with that and no one seemed to mind. I still had plenty of runners with me when we made the narrow merge against oncoming 5k and 10k runners around mile 2/4. I was able to cheerily negotiate some room for our group to get through without resorting to snowy sloppy berm running. I imagine this section may have been tricky for some paces. Thanks to Pat Dooley for braving the cold and getting some entertaining shots of our group! Heading back across The Hope Memorial Bridge was the only negative on the course. On any other non-icy day the footbridge is the perfect runners route, but given the ice on the footbridge it was tough; as a pacer I was torn between staying on the course or running the less-icy road. Since the street was open, I stuck to the pedestrian path even though I felt the road was safer – if a runner were to get hit it would be on my watch! Pace slowed to about 8:45 through here putting us right on target when we finally got to the safety of the ice-free road again. I encouraged my runners to finish strong and came in a little early with a surprise of the course being a bit short instead of long. I ended with a GPS pace of 8:28 and a bunch of happy runners! All in all I loved the course and would like to race it if I was in shape! I think a race day plan to move to the streets in case of ice next year would be a good idea. The medals for this race were great and the winners even got leg lamps! Though I am no fan of cotton long sleeves the shirt design was entertaining and will make for fun memories. The race packets even had Christmas Story tattoos for participants as well as free entry to the Christmas Story house. There was even Ralphie’s favorite, rich, chocolatey Ovaltine as a post-race recovery drink! These medals were so cool! Lot’s of runners were out in leg lamps, bunny suits, snowsuits, and bandit costumes. I had no idea the movie had such a following! Next year I will plan ahead and be a more festive pacer and/or racer! According to the race site, the mission was to “promote health and fitness, stimulate the local economy and galvanize the community.” This race had 5000 registered participants as well as many virtual participants, and on a very chilly Cleveland morning I saw many people out on the streets who otherwise would have been in bed. I’d say fitness was promoted! I saw many friends out and heard many reports of post race breakfast and celebrations so I would also say the local economy benefited. While there weren’t cheerers everywhere there was a surprising amount of support out in the communities for a first year race, galvanization successful! All in all Pepper gives this fun run an A+! They make great Christmas tree ornaments! I was amazed how many sign ups they had for the “virtual race” people must love their Christmas Story Themed medals! ahh, I didn’t even think of the Christmas tree ornament idea… genius! Best Christmas movie ever and in my opinion best medal I have ever seen!!! think I would be tempted to travel from Ottawa to Cleveland one year just to get that medal. BTW, I never realized part of the film was done in Cleveland. Much of the movie was done in several locations in Ontario, Canada. To me it has always had a very Canadian feel/look to it, though if you ask me what that means I would not be able to explain it! I assume next year they will be giving the same option they did this year for runners who cannot make the trek to Cleveland they provided a “Virtual” option where they sent you all the race goodies and you ran your own 5k/10k race at home that weekend! Awesome!!! Amy was my pacer for the RW Half Marathon this year! She was amazing!!!! I hope to run this next year! Pacer Jim’s group has always been fun! I am glad they had a mostly successful first year event! Definitely run next year! Just posted a picture of the medal on my blog – that is how envious I am of it!!! If you are willing to give up that medal I would definitely make a donation and run a “Christmas Story 10k Virtual Run”! How about I do a resolution run on either Dec 31 or Jan 1st? I have been complaining all week about lack of motivation, visions of that medal just might get me going again (currently struggling to run 4k!) . Here in Ottawa the charity Toy Mountain is struggling to get enough new toys and gifts for needy kids. My kids and I have gone shopping once to pick out and donate some fun toys, I would be so willing to head out again and donate more, and I know my boys would love to do it again. I’ll be in touch when I have completed my run. Merry Christmas!